Many experienced landscapers often pair dark mulches around vibrant flowers and plants. Believe it or not, Spring is just around the corner! Before we know it, the birds will be chirping, perennials will be popping from the ground, and we will be moving our winter coats to the back of our closets. In addition to grass seed and fertilizer, don’t forget to stock up on bags of mulch this year! It can benefit your yard in many ways. Here are some of the significant advantages of utilizing mulch for your landscaping efforts! Plants are not going to thrive if the ground around them is dry. Since this is the case, it is crucial that they have access to water during the hot parts of the years. One of the main reason people rely on mulch is that it helps the ground retain moisture. By doing so, you will be setting your property’s plant life up for success this spring season. Color is a huge part of landscaping. Incorporating color into your landscape is one of the best ways to attain curb appeal for your yard. It is also important to keep in mind that there is a contrast in color throughout your property. Think of mulch as the perfect background for your colorful inpatients that you have scattered throughout your yard. Many experienced landscapers often pair dark mulches around vibrant flowers and plants. Double shredded hardwood mulch is the most common type of mulch. Its natural color is a dark brown-grayish color but other options include the dyed colors of medium brown, black and red. Do you struggle with erosion in your yard? This is a common problem that many homeowners face every year. When a spring rain shower rolls through, it can easily wash away your precious soil at a moment’s notice. 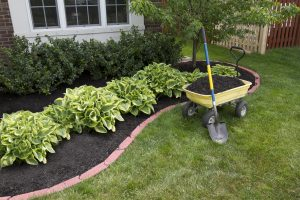 If your yard suffers from erosion, you should consider spreading out a layer of mulch in your yards problem areas, as it protects the ground. Crabgrass, dandelion, common daisy, and ground ivy are among some of the most common types of lawn weeds. They are blemishes to your outdoor landscape and can quickly overtake a garden if you are not careful. Mulch is a great way to keep the weeds in your yard to a minimum. This entry was posted on Thursday, March 1st, 2018 at 2:12 pm. Both comments and pings are currently closed.